Historical horse racing is creating historic purses at Kentucky Downs — not just in Kentucky but in America. More than $15 million has gone into purses paid to owners running their thoroughbreds at Kentucky Downs the past four years as a direct result of the track’s 2011 installation of historical horse racing. And that’s not counting the almost $7 million earmarked for the upcoming five-date meet for purses and Kentucky Thoroughbred Development Fund (KTDF) purse supplements derived from the innovative gaming technology that adheres to pari-mutuel methodology. The remainder of purse money is generated from betting on track and through simulcast wagering across the country on live racing. Kentucky Downs is offering overall purses, including KTDF, of $7.8 million for the unique all-grass meet that runs Sept. 3, 8, 10, 11 and 15. Thanks to historical horse racing, Kentucky Downs will offer some of the most lucrative purses in North American racing history. Those include unprecedented $130,000 maiden races and allowance races up to $145,000. Even without KTDF enhancements for Kentucky-bred horses, maidens foaled outside of the commonwealth will run for $58,000 — the highest in the state and among the biggest in the country. Horses not eligible for the Kentucky-bred money still will compete in first-level allowance races for a very healthy $65,000 pot, most in the commonwealth. “Historical horse racing is changing the industry economics,” said Kentucky Downs president and part-owner Corey Johnsen. “It’s important for horse owners to have a legitimate chance to break even or make money for all their investment in this very labor-intensive sport. 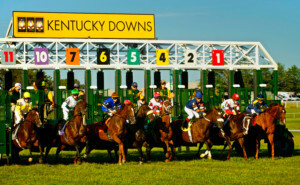 The baseline year is 2011, when the Kentucky Horse Racing Commission approved Kentucky Downs’ application to offer historical horse racing, with terminals for that alternative revenue stream installed that fall. Purses that year totaled $746,810 for 30 races. Once historical horse racing was up and running, purses grew to more than $2 million in 2012 for 43 races, ballooned into $4.15 million for 50 races in 2013, $4.8 million for 50 races in 2014 and $6.6 million for 48 races last year. Kentucky Downs is not the only purse account benefitting from gaming at the track. This year, in an arrangement enthusiastically approved by the Kentucky division of the Horsemen’s Benevolent and Protective Association that represents owners and trainers at both tracks, Kentucky Downs contributed $1.35 million into Ellis Park’s purse account. That has allowed the Henderson track, which has been working hard to develop its own historical horse racing market, to greatly improve its quality and have its best racing product in many years. As part of the agreement, Ellis Park gave up racing Saturday, Sept. 3, with that date becoming Kentucky Downs’ meet opener. In 2012, Kentucky Downs contributed a combined total exceeding $1 million to its four sister thoroughbred tracks in KTDF purse supplements generated by play on historical horse racing, according to Kentucky Horse Racing Commission statistics. 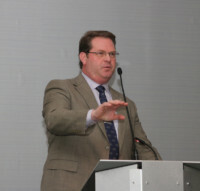 In addition, historical horse racing at Kentucky Downs has produced $712,755 for the Kentucky Breeders’ Incentive Fund, which was established to reward the breeders of KBIF-eligible horses that win non-claiming maiden, allowance and stakes races in the United States and at Canada’s Woodbine racetrack. “This is the strongest the Kentucky circuit has been in at least 10 years,” Johnsen said. “By the entire industry working together, we’re accomplishing the goal of advancing Kentucky racing. Keeneland has excellent purses, but that will only go up with their strong investment with The Red Mile in historical horse racing. That effort will start paying dividends. 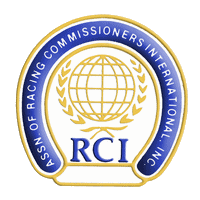 Turfway is KHRC-approved for historical horse racing, and that organization is working diligently to bring in that alternative-gaming source to enhance its racing. Under the enabling regulations, half of the 1.5 percent parimutuel tax on historical horse racing goes into the Kentucky Thoroughbred Development Fund that supplements purses for non-claiming races for horses born and sired in the commonwealth. That has become a huge number: Last year for the first time, KTDF purses paid out at Kentucky Downs were greater than the basic association purses: $3.42 million to $3.18 million. Also benefitting from the parimutuel tax is higher education, the state’s General Fund, equine drug research and equine industry programs. *In 2012, Kentucky Downs contributed the following in Kentucky Thoroughbred Development Fund purse supplements to other meets in the commonwealth: Ellis Park $500,946; Keeneland fall $153,206; Churchill fall $174,807; Turfway holiday $209,135. Source: Kentucky Horse Racing Commission. **Doesn’t include $1.35 million contributed to Ellis Park’s general purse account.